Here is an idea for making soap from your garden herbs. Handcrafted herbal soaps help cleanse the body, while invigorating your senses. 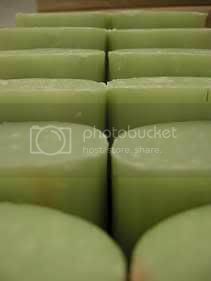 Herbal soaps whether homemade or bought, provide increased cleansing power, soothe and help protect the skin. Commercially made soaps usually contain animal products such as tallow or lard, as well as many undesirable chemicals and synthetics. These can play havoc with your skin, exacerbating existing conditions and causing others such as clogged pores, dry skin, rashes and more. In most cases, the glycerine has also been removed. Your skin readily absorbs what is put on it, good or bad. It is one of the quickest ways for chemicals - or nutrients- to enter your body. Be mindful of what you put on your skin, the largest organ of your body. Here are the ingredients used for a basic soap mix - caustic soda, water, coconut oil, vegetable shortening and olive oil. Be careful though as the caustic soda will burn the skin on contact. The chemical reaction with the oils should neutralise this. Steep dried or semi-dried calendula flower in olive oil in a jar, sealed, for two to three weeks, then strain oil. A faster method is to steep dried calendula flowers in water and use strained infusion in place of all or part of the water called for in the recipe (Or combine both methods). Add this to the basic soap mix for a very mild baby soap. The comfrey root gives the soap a special healing, soothing quality as well as a beautiful dark violet colour. Collect and dry enough comfrey root to produce 110g ounces of powder (about a 1 foot root). Roots must be thoroughly dry before you pulverize them in a blender. This needs to be added to the basic soap mix along with lavender oil, rosemary oil and aloe vera extract. Add a small amount of lemongrass oil to lemon vinegar oil to fix scent. Mix with the basic soap mixture along with lemon verbena oil and tumeric for colour (optional). I make my own soap with lye, and compared to commercial soaps its the most gentle moisturising soap I've ever used! My kids have sensitive skin and anything from the shop flares it up. I use organic ingredients and herbs from my garden, including leaf, petals and seeds. Grated rinds of organic citrus fruits give wonderful texture, or experiment by adding coffee grinds to exfoliate, or even fresh veg from your polytunnel including chopped cucumber or strawberry. experiment by adding coffee grinds to exfoliate, or even fresh veg from your polytunnel including chopped cucumber or strawberry. I think I prefer the sound of coffee soap to herbs, I love the smell of coffee!